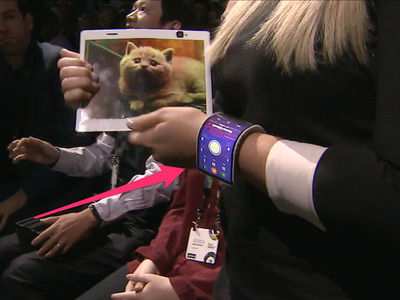 Lenovo just teased a smartphone with a bendable display that can wrap around a wrist. It’s the first of its kind so far. The only other time we’ve seen a bendable display that bends to such an extent is rumours of a smartphone with a foldable display made by Samsung. But any details surrounding Samsung’s foldable smartphone are still rumours at this stage. Lenovo also teased a tablet also with a foldable display. Demonstrated by Meghan McCarthy, she folded the tablet in half and held it up to here ear like she would a phone. Lenovo didn’t mention anything more about the device, suggesting it’s just a concept at this stage.